How to Read an Essay Assignments usually ask you to demonstrate that you have immersed yourself in the course material and that you've done some thinking on your own; questions not treated at length in class often serve as assignments. Fortunately, if you've put the time into getting to know the material, then you've almost certainly begun thinking independently. In responding to assignments, keep in mind the following advice. Beware of straying. Especially in the draft stage, "discussion" and "analysis" can lead you from one intrinsically interesting problem to another, then another, and then ... You may wind up following a garden of forking paths and lose your way. To prevent this, stop periodically while drafting your NZessaywriting and reread the assignment. Its purposes are likely to become clearer. Consider the assignment in relation to previous and upcoming assignments. Ask yourself what is new about the task you're setting out to do. Instructors often design assignments to build in complexity. Knowing where an assignment falls in this progression can help you concentrate on the specific, fresh challenges at hand. Understanding some key words commonly used in assignments also may simplify your task. Toward this end, let's take a look at two seemingly impenetrable instructions: "discuss" and "analyze." For island merchant hours, please contact the business directly. The Granville & 5th Ave at the south end of the Granville Bridge, is also an interchange for many of the urban and suburban routes. Hop off your bus at 5th Ave and walk 5-10 minutes northward under the bridge to get to Granville Island. For more information about Vancouver's bus system, go to: translink.ca or call (604) 953-3333. The rainbow-coloured Aquabus travels around False Creek with stops at the foot of Hornby St., Stamp's Landing, Yaletown (foot of Davie St.), and Science World. The Aquabus dock on Granville Island is located between the Public Market and the Arts Club Theatre. The False Creek Ferries also travel around the Inlet and stop at the Maritime Museum (west of Granville Island), the Aquatic Centre (under the Burrard St. Bridge, on the downtown side (north) of the Inlet), Stamp's Landing, and Science World (the easternmost point of False Creek). The False Creek Ferry dock on Granville Island is located near the entrance to Bridges Restaurant. If you've got your own water-based transportation, there is a free public dock behind the Public Market that allows three-hour moorage. Space is limited, and is first come, first served. Getting to Granville Island by car is easy since many main thoroughfares run nearby, including the Granville St. Bridge above, and 4th Avenue to the south, and Burrard St. to the west. From your point of origin, travel towards the intersection of West 4th Avenue and Fir Street. Then head north on Fir Street, and take either the first right at West 3rd Avenue (which turns into Anderson St. to the left (north)), or take the second right at West 2nd Ave.
You will then find yourself at the intersection of West 2nd Avenue and Anderson St., and should be able to see the Granville Island sign under the bridge looking northward on Anderson St. Follow Anderson St. onto Granville Island. As soon as you turn the corner onto Cartwright St., (where the Kids Market is located) you'll notice that all of the streets on the Island are now one-way. Since Granville Island is people-friendly, there are many pedestrians walking about. While driving, please be aware of pedestrians, and watch for children. Parking on Granville Island is limited. If you can, leave the car at home and get to Granville Island by bus, boat, bicycle or on foot. Bicycle routes to Granville Island follow the main car routes, but there's also a pleasant, scenic bicycle path (shared with pedestrians) that runs east-to-west past the Island along the south shore of False Creek Inlet. Aquabus also has a bike-friendly boat - the Cyquabus - that allows bicyclers to hop aboard from the dock at the foot of Hornby St., at an extra 50 cents per bike. Many bike racks are located conveniently throughout the Island. Be sure to use a sturdy lock and fasten your bike securely. Arriving on Granville Island by foot enables you to appreciate the Island from a whole new angle. A comfortable seaside walk follows the False Creek Inlet on both the north and south shores. The south shore walk, which passes right by Granville Island, begins at its easternmost point just under the Cambie Street Bridge, and heads all the way west to some of Vancouver's most popular beaches. Walk from anywhere in the downtown area to one of the False Creek Ferry or Aquabus docks at the Aquatic Centre, Yaletown, Science World, the foot of Hornby St., or the foot of Davie St. Hop on the boat for a quick jaunt over to Granville Island. You'll be following the underside of the Granville Street Bridge for some of your journey if you head to Granville Island from the south. Many roads culminate at the intersection of Anderson St. and West 2nd Ave., so take your pick, and watch for traffic. During the peak season from May 1 – September 30, Granville Island requires tour buses entering the Island before 6 PM to purchase a Day Permit. 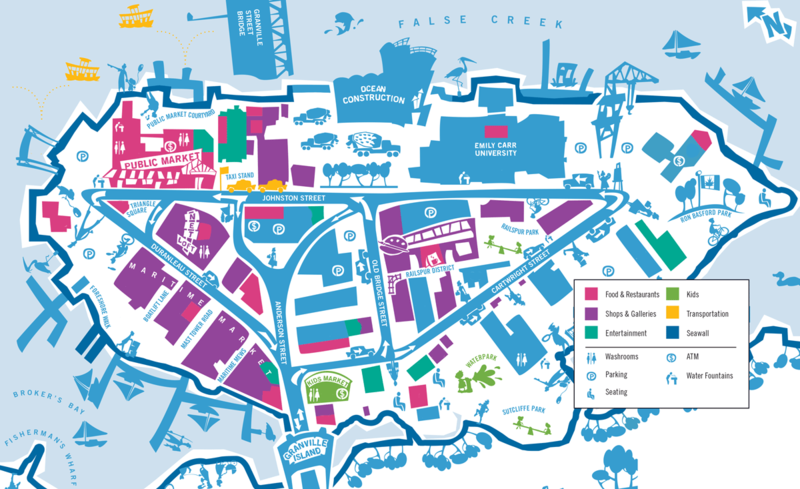 From 9 AM – 6PM, there is no bus parking available on Granville Island. For summer evenings (May 1 to September 30, after 6 PM) and all times during the winter (October 1 – April 30), there are six bus parking stalls available for $10/hour on a first come, first serve basis. For more information about the policy and purchasing details, see the attachment below. No, it's not always raining in Vancouver. In fact, Vancouver is known among Canadian cities for its mild climate, and Granville Island's is milder still. The combination of urban convection (whereby the city around generates its own heat) and being on the water - where, thanks to the Japan Current, the temperature consistently stays above five degrees Celsius - the Island seldom suffers a frosty morning. In summer, the afternoon winds off English Bay ensure the temperature rarely rises above 25° C. May through October is normally dry, but during winter months it rains. A lot. Adapted to the rainy season, Granville Island incorporates generous awnings and covered walkways into its visitor areas, but it's good to be prepared for some dampness. Windbreaker. There's almost always a breeze. Windproof and waterproof fabrics such as Gore-Tex have become the unofficial uniform of the Pacific Northwest. Sensible shoes. Sturdy walking shoes or light hikers that can absorb acres of pavement and brave the occasional puddle will make your day more pleasant. Sweater or fleece top, gloves. Advisable from October to April, especially if you plan to get around on the water. Knapsack or shoulder bag. Convenient for squirreling away a few exotic groceries souvenirs. Sunglasses. Hey, you never know.